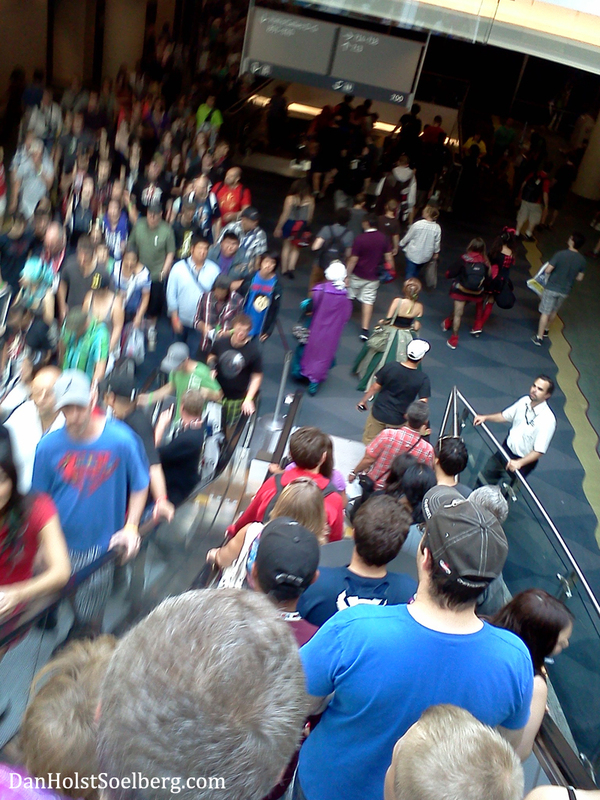 And that was Fan Expo this year! 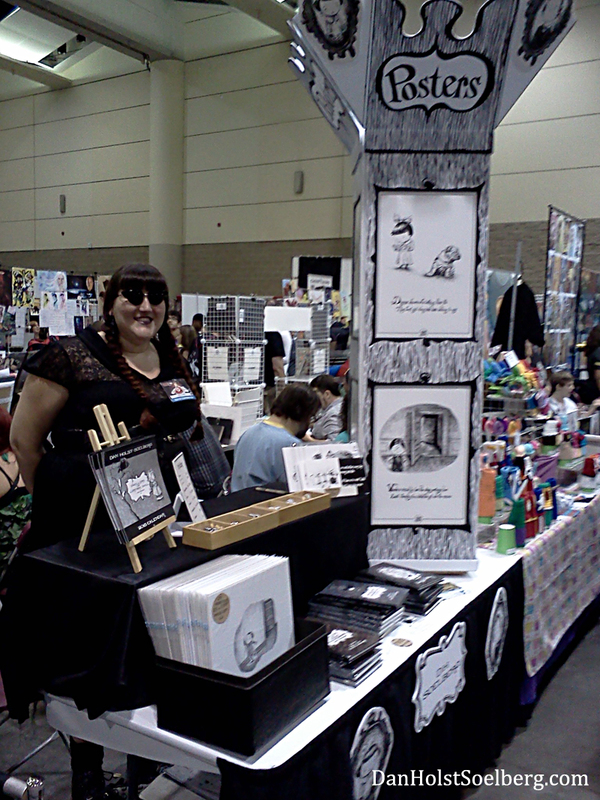 This is my third Fan Expo, and I decided to improve on my poster display – aka the tower – once again. The tower has already gone through two facelifts but this time I went for a complete redesign. Let’s rewind. 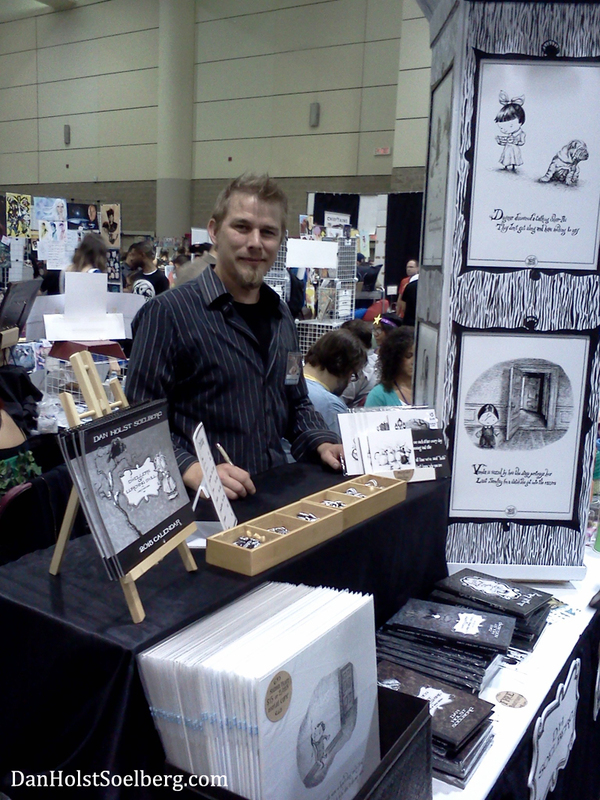 It’s the morning of Thursday, August 28, and I have to set up at the convention centre. Time is ticking and my new tower is in pieces. All the parts of the display are cut but nothing is assembled and the entire thing still needs to be painted. When you take care of two kids, time can easily run out and last-minute plan revisions are a daily thing. Within a few hours I painted what I could, packed the car and set off for the Metro Toronto Convention Centre. I arrived with Jaime (my wife) and son Grey (the baby was with Nana) just in the nick of time. Set-up went faster than ever with my new fandangled tower. The only thing missing was the crown on top. 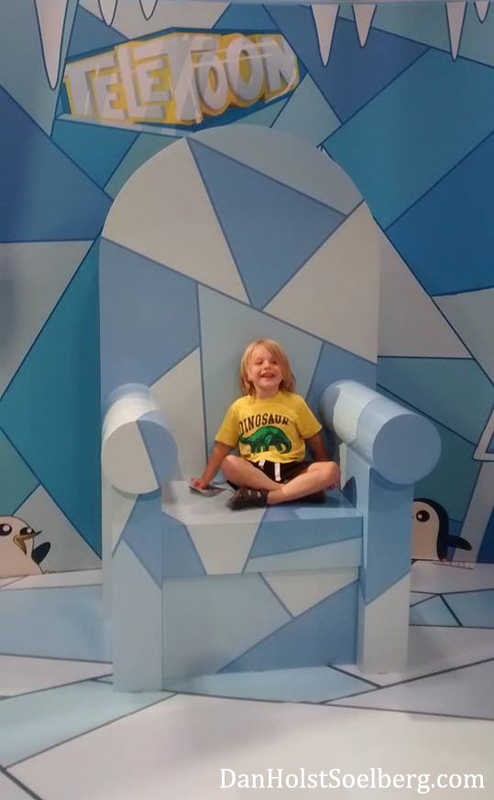 Grey posing at the TELETOON booth. So while Jaime and Grey explored the convention, I painted and assembled the crown on the spot. It wasn’t how I imagined spending my first day at Fan Expo, but it all worked out wonderfully. Day one: check! Here I am with my new tower. A photo below shows the crown I added on the first day of the Expo. Friday, my friend Courtland Shakespeare was able to step in for Jaime as my table partner. Courtland is a remarkable creative entity that published The Perfect Round a couple years ago and is always working on something astounding. Courtland’s book has its own website where you can purchase it. He is a living encyclopedia of film (amongst other things) and made my day an absolute blast! I forgot to take any photos whatsoever, so I left the day without a single pic of Courtland. He did impart several film recommendations that I wrote down, and a slew of film trivia that have already rushed through the sieve that is my memory. Day two: check! 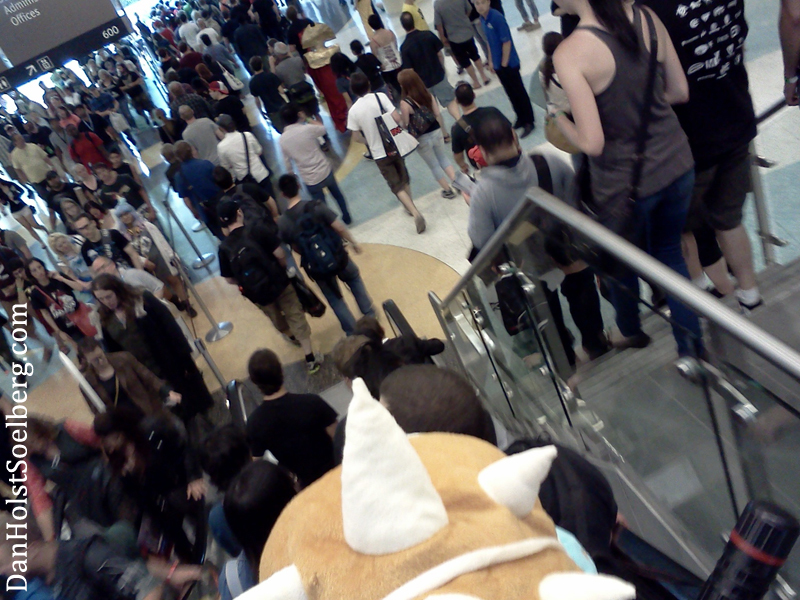 Crowds on the escalator ride down to the convention floor. Saturday and Sunday were a blur of crushing crowds, conversations with wonderful fans and quality time with another one of my favourite people, Alexandria Ann Widgery Giamos. The vivacious Alex at my table. Note the tower, complete with its new crown. I was so fortunate to have Alex help me manage my table for two days. Alex is a force of nature with her blog Not Afraid to Wear Heels that celebrates bold fashion for the plus-sized. Aside from fashion, she is also passionate about comics, movies and books. My short description does not do her justice. Check out her blog here and Facebook page here. Alex and I share a love for the elaborate costumes that hundreds of visitors parade throughout the convention weekend. There is no financial reward for all the disciplined work put into their costumes, but at Fan Expo they get the admiration and attention they deserve. I am in awe of this high level of fan dedication. To see Alex’s blog post with some of the photos she snapped, click here. 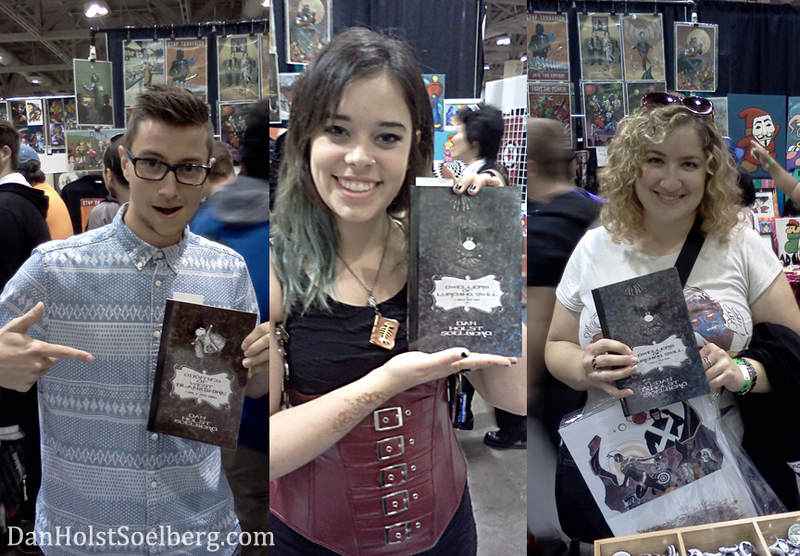 I snapped some photos of fans with my books. You are all my favourites. I love you all equally. Speaking of fans, I was thrilled many times over to meet new fans and see familiar faces from past conventions. I make my books to be loved, so it’s gratifying to know that they are. It is humbling, flattering, exciting and ego inflating all at once. Teardown of my entire display was a breeze. It all folded down and tucked into a rolling suitcase and a dolly that I wheeled from the convention centre floor to the train at Union station. And that was day three and four: check! Thanks to all who attended, and the organizers who made it possible. I’m looking forward to next year. I’ve already booked my booth! Apologies to anyone who couldn’t get their hands on my 2015 calendar. It sold out rather quickly. I’m happy to announce that it will soon be reprinted and available at my online shop. I will also have copies with me at the Hamilton Comic Con happening Saturday, October 4th. Click here for details at the official website. I bought up a bunch of ben wicks art before the pub in Toronto closed. would the art be worth anything today ? You’re so lucky to have a bunch of original Ben Wicks artwork! I just have the one that Ben gave me, so I’m not qualified to estimate value, but I’d say you have one heck of a treasure trove on your hands.